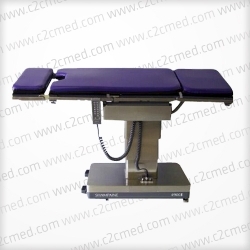 The Shampaine 5100 major surgical table provides flexible articulation for complete patient positioning. 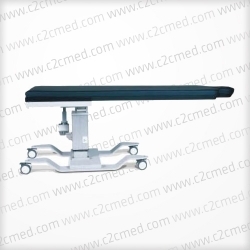 The Shampaine 5100 major surgical table provides flexible articulation for complete patient positioning. Through the use of Electroluminescent (EL) technology, the 5100 series tables are the only tables available with “Full-Function Key Illumination”. These tables have a longitudinal slide feature for full length image amplification. 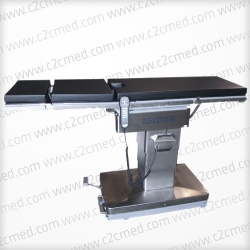 Each of the five table sections, including the 15” leg extension, come standard with a built-in x-ray cassette tunnel. These tables are capable of returning to the horizontal position (true level) through the convenience of one button activation. The 5100B is battery-powered. The table may be operated with or without the power cord connected. Mains power is only required to recharge the battery. The battery recharge system will restore completely discharged batteries to 80% of full charge within eight hours (8) and bring the table to a full charge within twelve (12) hours of continuous charging.